Dmitry Liss is recognized as one of today's most exciting young conductors. As Chief Conductor of the Ural Philharmonic Orchestra and guest conductor of the Russian National Orchestra, he has won praise and rave reviews for his interpretations of the Russian masterworks as well as of contemporary music. Born in the former Soviet Union, Dmitry Liss graduated in 1984 from the Moscow Conservatory, where he studied under Dmitri Kitayenko. By 1991 he had risen to Principal Conductor in Kuzbass, becoming at age 31 the youngest chief conductor in Russia at that time. 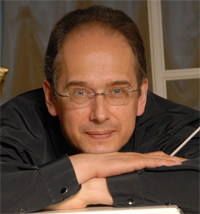 In 1995, Dmitry Liss was named Artistic Director and Chief Conductor of the Ural Philharmonic Orchestra. During the same year, he won the First International Competition of Young Conductors in Zagreb, Yugoslavia. Following his debut with the Russian National Orchestra in 1997, he began to tour internationally with the RNO and was appointed Associate Conductor in 1999. Dmitry Liss has toured Asia and the United States and throughout western and central Europe. As guest conductor, he has led major international orchestras, such as the Moscow Philharmonic Orchestra, St Petersburg Philharmonic Orchestra, Bergen Philharmonic Orchestra, Budapest Philharmonic, Orchestre philharmonique de Strasbourg, Staatsorchester Rheinische Philharmonie, American-Russian Youth Orchestra, and the World Youth Orchestra. Prominent soloists who have performed under his baton include Mikhail Pletnev, Gidon Kremer, Yuri Bashmet, Peter Donohoe, Mstislav Rostropovich, and Wynton Marsalis.